A friend of my friend was taking photos at her daughters birthday party. Turns out that unfortunately her son died tragically only a couple of weeks later. I was not able to question her about the picture directly. All of this is second or third hand information. When she got her pictures back (either old school film or memory card is what I'm thinking) she found this image mixed in with photos of the party. I'm guessing she took this photo with her phone of the original and sent it to my friends phone with her phone. From there I forwarded that message to my phone, then to my email. I used a photoshop type software to lighten the image so it could be seen more clearly. I then posted that image here. I won't taint your opinion by giving you my opinion until later. 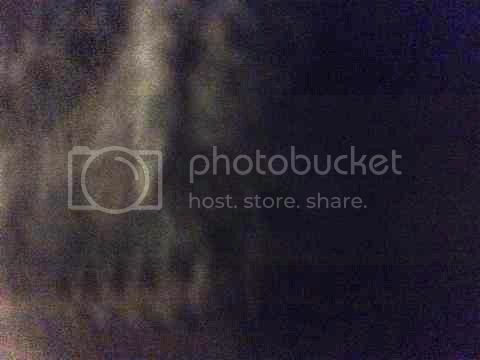 To me it looks like a dim, really close image of cloth with a zipper at the bottom edge. I was thinking of a zipper too. An accidental shot blurred severely by camera movement. If you look closely you can see patterns that repeat indicating rapid movement. But it sure looks like the face of some kind of demon or something otherworldly. Look closely - do you see it?